There are a couple of reasons you may want to build a spiral staircase instead of a standard staircase. They take up less room than standard staircases and can solve space problems both indoors and out. They also have a distinctive look that can be a dramatic focal point while still being functional. In Medieval times, spiral staircases wound up into turrets and church pulpits, or descended into cellars and dungeons. The history of this early architecture lingers, making spiral staircases romantic choices. Consider some practical elements of building one before you get too far into the planning process though. Before you become too enchanted with the idea, evaluate the space you have available, and confirm the building codes in your area. Kit suppliers and custom builders know basic code standards, but local codes can vary, so do some checking. Sole access and secondary access staircases can have different regulations, as do staircases that lead to open or enclosed areas. Typically, space is the biggest limiting factor when determining whether or not a spiral staircase will work for your application, and since space savings is one of the biggest reasons people add spiral staircases, inches count, so take precise measurements. Although they may be a great solution when space is a problem, spiral staircases aren't always ideal. The object of stairs is to get from one place to another, and sometimes you aren't alone. If you're carrying something, like furniture or an oddly shaped hamper or box, maneuvering the spiral can be difficult to impossible. The space can be cramped too, particularly if you are big boned. The elderly and people with stiff joints or other physical challenges will probably do better with standard staircase designs too. 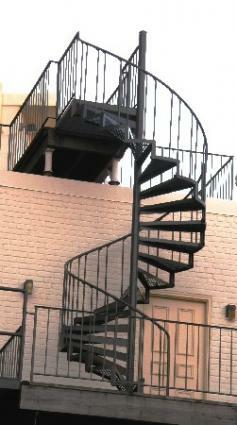 Spiral staircases can be made from many different materials. Your budget will be the determining factor here. You can find basic, utilitarian kits for a few hundred dollars, and on the other end of the spectrum, elegant, floating confections with scrollwork and brass accents for many thousands of dollars. While you're planning, keep in mind that the staircase itself, with minimum adornment, will be pretty eye catching, so keep things in perspective. When you build a spiral staircase, the math can get a bit tricky. You may discover that it's easier and more satisfying to let someone else do that part for you. The many kits and plans out there will handle the geometry and leave the physical labor to you. While you're in the planning stages, mark the projected spot on the floor and ceiling with tape to get a better sense of how much space is involved. If possible, avoid building within a couple of inches of walls. Giving yourself some extra room will make it easier to get the final measurements right. Curves can be tricky. Remember to account for the width of the handrails when making your calculations. Not all spiral staircase kits meet code, so be sure to ask the manufacturer. If you are an experienced woodworker or handyperson, you may be able to install a spiral staircase yourself, but it isn't a one-man job, so plan on calling in a few favors. Floor-to-floor height is not the same as floor-to-ceiling height. Spanning the area from the floor under the first step to the floor where the staircase ends, floor-to-floor is an important measurement, so spare yourself a headache and get it right the first time. Note: This will usually not include carpet thickness. Whether you custom build a spiral staircase from scratch or use one of a variety of kits, it can be an ingenious way to access a second story room, hall, or loft. It's one of the few times in life when going around in circles actually gets you somewhere.